I took this picture several weeks ago during the rainy season! I thought it looked appropriate for Halloween. And this pic came along for the ride. 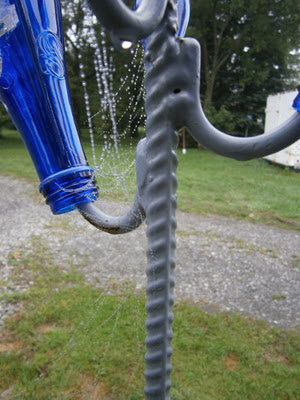 Interesting water droplets pattern. A little known fact: As a child I HATED trick-or-treating! My favorite Halloween was when I was in third grade and had chicken pox and couldn't go trick-or-treating! My brothers gathered candy and brought it home to me! I have made a few pumpkin/jack-o-lantern wallhangings, but I don't do any specific decorating for Halloween. On the other hand, I do have a fabulous fabric pumpkin made by Nancy A. that sits on the dining table during the fall/Thanksgiving season. So there you have it. An odd post to be sure--but definitely not scary. P.S. I am listening to Sleeping Doll by Jeffery Deaver. Wednesday was truly an "all star" day! 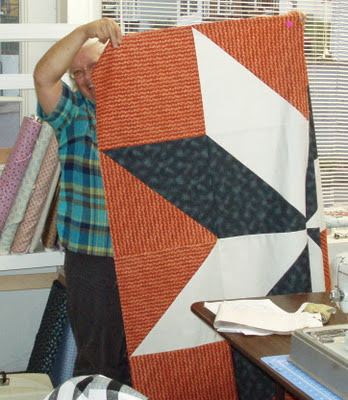 Four ladies worked very hard on rotary cutting, precision machine piecing, and pressing to make what I call a "triangulated star". First up is Marlene with gorgeous shades of purple and black. A gift for someone special, it is absolutely stunning! Chris is up next with dark gray, white/silver and a brick-ish basket weave background. We purposely chose to alternate the basket weave fabric to add even more interest. Chris has started pinning her two halves together ready for that final seam. 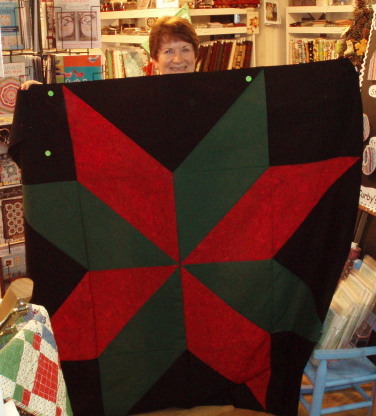 Wilma chose dark green, bright red and black for her star. 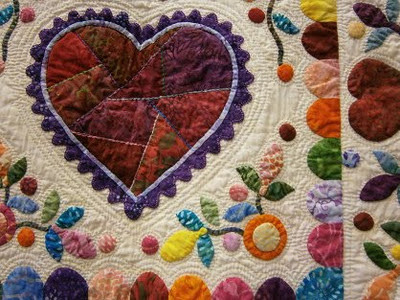 She has a bright pink for the small border and a lovely rose patterned fabric that pulls in all the colors for her large border. Truly eye-catching! And Claire! 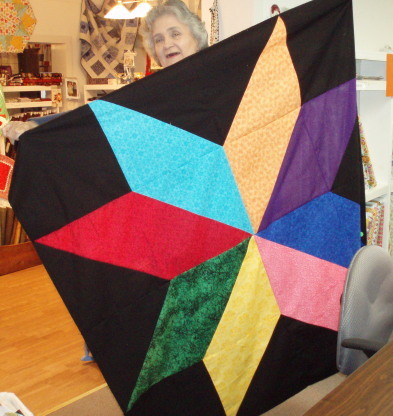 Claire chose to use eight different fabrics combined with black for her star. 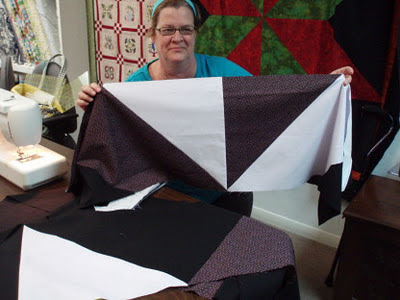 Her plan is to use scraps from the star colors to make the small border, followed by black. Her grandkids will love this one! As you can see, what a fun and productive day. We cut and laughed and sewed and laughed...well, you get the idea. Great job, ladies! P.S. Yes, Kathleen, you remember Penny from the In Baltimore Style class! And she is always smiling! 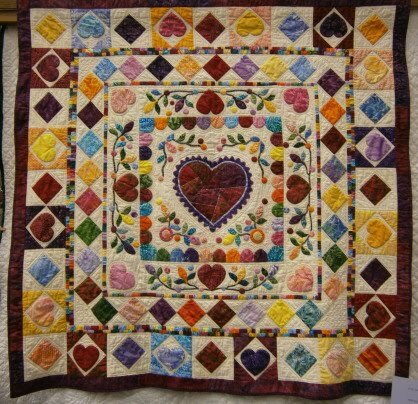 Love the borders on your new quilt! Knock Knock Knock...Penny! (Sorry, I couldn't resist!) But this really is Penny! Part of Penny's consolation prize for not going on her planned trip with friends was that I would put her picture up on the blog. (Okay, her friends were texting her and emailing her pictures from the trip--and they were supposed to be in class with Penny if they had not gone without her! So turnabout is fair play.) So Penny has worked on her first Monthly Bliss 1 block and is making good progress. I was thrilled to see her, but sad that she was not on her trip. Life...happens! 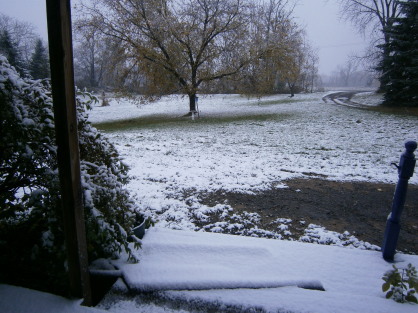 Today we received these gifts: snow and wind and cold. 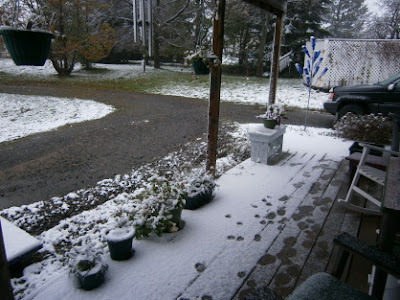 It's not unusual for us to have snow on Halloween--but we aren't at Halloween yet. Geez! Killing frost tonight. Notice that the hops vines on the shed are pretty much gone already. On a personal note, many thanks to all who have commented or sent cards or thought of my family. It has meant more than you know. I am truly blessed to have such wonderful people in my life. You are indeed special. More tomorrow. Class pictures from Wednesday to show! P.P.S. Lest you think Penny and I were upset with her friends for going without her, we were not. Their texting was a way of keeping her close. True friends. Our world is poorer and heaven is richer...because heaven now has my dad. Regular readers of the blog know that I rarely talk about my family. But my dad was such a special man that I want to share him with you. 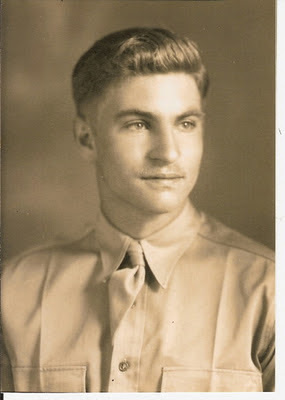 You may remember that I first showed his picture in a prior post of veterans from my family. Such a handsome man. A dedicated husband and father. His legacy includes hard work, love, friendship, laughter, patience and so much more. Last night my mom, youngest brother, and I were with him when he made his final journey. He was such a special man--I can't think of a single person who didn't like him. His ready smile and great sense of humor have been passed to us, his lucky children. 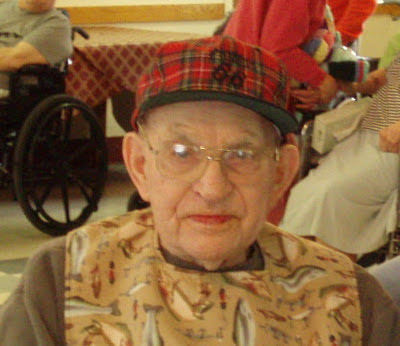 Here is a picture of him taken in February on his 91st birthday. You can see that special mischievous gleam in his eyes. He will be greatly missed by all who knew him. I love and miss you, Dad. See you on the other side. This is just too exciting! 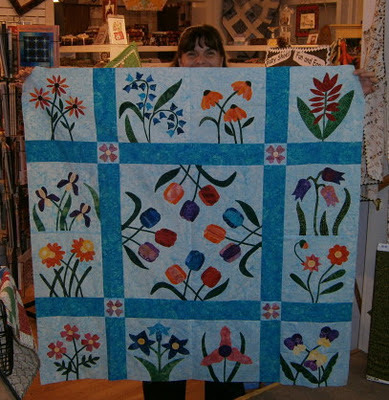 Marie finished her Flower Garden top! She decided to add borders all around the outside. 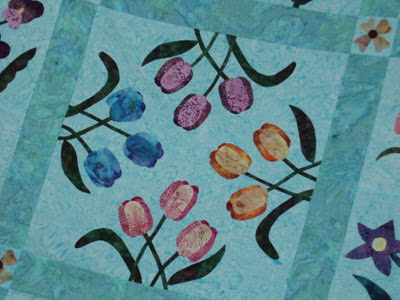 Her color choices were bold and beautiful, and I love that she grouped her tulips by color family instead of alternating them. A close-up of the center. Great job, Marie! P.S. I just finished listening to The Edge by Jeffery Deaver and have started One Summer by David Baldacci. 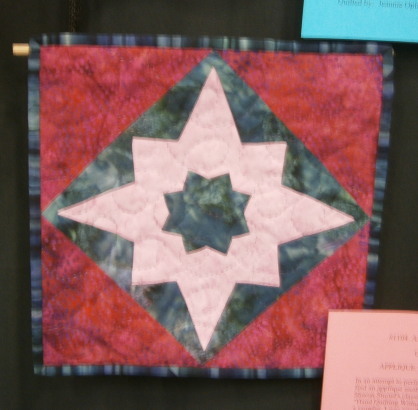 One last glimpse from the quilt show. 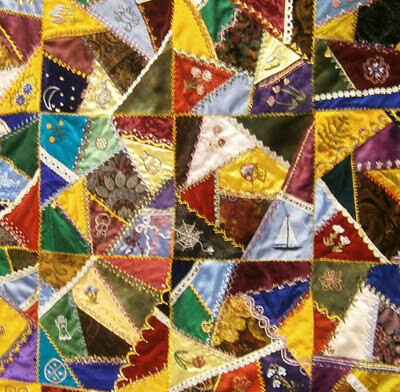 Another of Marion T.'s beauties--her crazy quilt. Marion is a master embroiderer, and this piece showcases her skills. 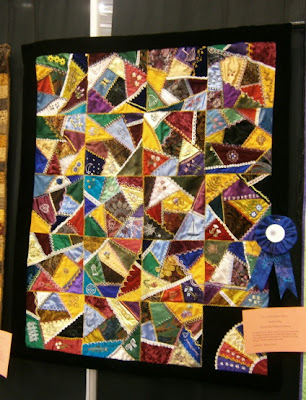 She also won a Viewer's Choice first place ribbon! Isn't the detail amazing? If I remember correctly, she was trying not to repeat any of the stitch patterns. Truly breathtaking! I can't wait to see what she's up to next! That's it for tonight. I've spent quite a bit of today painting, and you will see the results of that soon. Til next time, dear readers, remember how truly special you are. On October 6, Traci brought in her finished Flower Garden top! We have spent 13 months working block-by-block to bring this to fruition. Absolutely stunning, Traci! 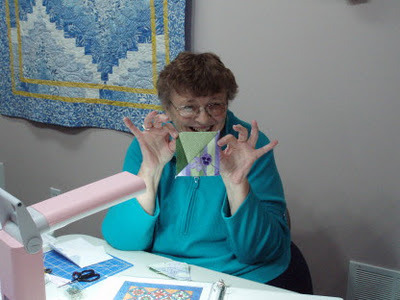 (Now she's on to hand piecing for 10 months!) There should be more of these lovely pieces to show over the next few months as others get their tops finished. 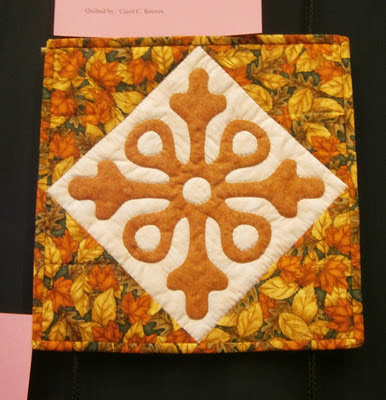 The Tompkins County Quilters Guild Show was the first weekend in October and several of my students had finished quilts to show. 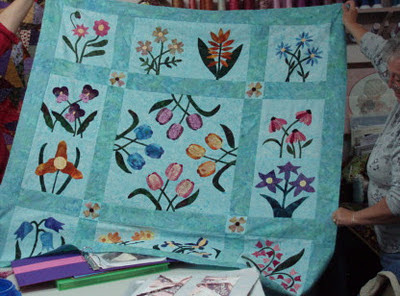 First, Carol R. of Ithaca hand appliqued and quilted "All Curves." And "All Points." What a thrill to see these hanging! Great job, Carol! Marion T. hand appliqued, embroidered and quilted this beauty. Based on a Kaffe Fassett pattern, she should be proud of this accomplishment. Here's a close-up of the workmanship. Just superb! More to show next post. Did you miss me? P.S. I am listening to The Edge by Jeffery Deaver and reading The Hounds and the Fury by Rita Mae Brown. Also listened to The Chopin Manuscript, a serial thriller by Jeffery Deaver, et al.